At 40, Lanre Da Silva Ajayi has looks that still makes heads turn. With that ageless look, which has a streak of innocence, Lanre Da Silva will give social media slay queens a run for their money. She is a testimony to the saying, “hardwork does not kill”. 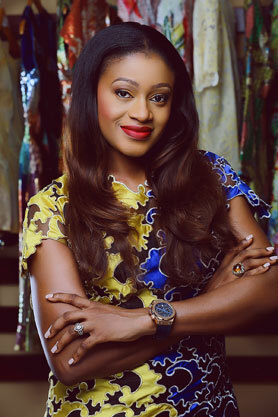 Based in Lagos, Lanre Da Silva is one of Nigeria’s leading fashion designers. She was born on the 6th of August 1978 and she is married to Kunle Ajayi. After her high school graduation which she completed in Nigeria, she moved to the United Kingdom to study Business Administration at Coventry University. She then went on to obtain a Master’s Degree in Finance from the University of Leicester. When she got back from her studies outside the country, she started to look for a job in investment banking or the Nigerian stock exchange and she applied to various banks and institutions in Nigeria. However, during this waiting period, she decided to keep herself busy by designing clothes for herself, family, and friends. Nonetheless, fashion designing wasn’t something she stumbled on as she had been designing since her teenage years and even attended short courses on fashion designing while in the UK. She also developed her love for vintage couture from shopping spots like Portobello market, London Vintage Fashion, Textile and Accessories fair at Hammersmith Town Hall. Lanre Da Silva Ajayi launched her fashion line in 2005 working from her parents dining table, amidst the challenges of finding experienced tailors and zippers to work with in Nigeria at the time. In 2008, her pieces were showcased at the Thisday Africa Rising Festival in London. Also at the 2009 Arise Africa Fashion Festival inÂ South Africa, the 2009 New York Couture Fashion Week, and the 2011 Arise Magazine Fashion Week in Lagos. Most recently, in 2018, British Supermodel Naomi Campbell opened the Arise Africa Fashion Festival with one of her outfits. Lanre Da Silva Ajayi has two siblings is related to Big Brother Naija’s Leo Da Silva. She unwinds by hanging out with friends and family. Her beauty routine consists of Argan oil which keeps the skin hydrated, and spa treatments. She also loves Yoga.